I'll be joining you when the wind is from the "right" direction! Naturally, all crews at sea and in the air prefer calm conditions because they have to perform work onboard! What's with our old lady (NX) now...., huh...., 'talfh'...?? Just now, as I write, she got about 20 minutes left before she arrives in Aalesund. Last edited by Sterkoder; November 12th, 2009, 15:51. 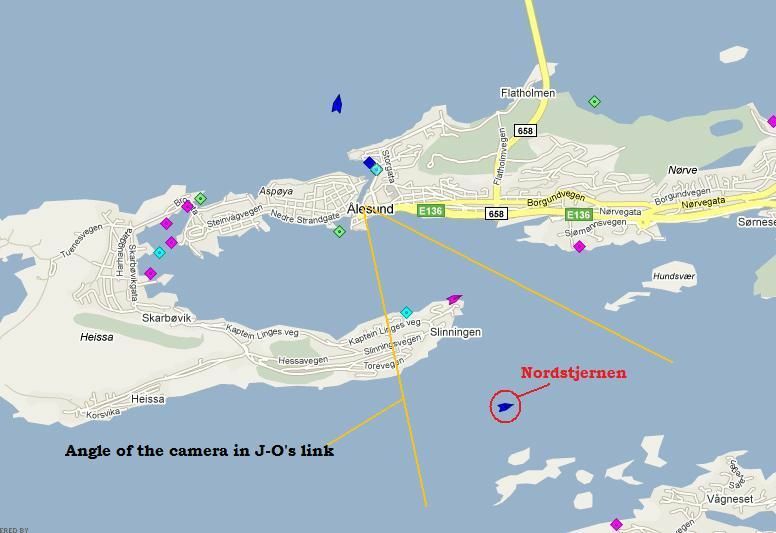 As far as I can see on my secret little instrument ( ), she's steaming (or being towed, if the report is true) towards Spjelkavik and what I belive is Fiskarstrand Shipyard. I belive we just have to wait for 'talfh' . She is right behind this big 'stone'.. should come into view in a few minutes. That 'big stone" is that my home island of Hessa???? Just got a mail from the purser on board "Nordstjernen" saying the tow was due to technical problems and that the sailing between Bergen and Trondheim is cancelled. The mail said nothing about what the problems was and nothing about when the route will continue from Trondheim. I don`t like this news . Or even worse, lack of news. I was a few minutes "behind" you, Sterkoder. Thanks for info. We just have to "hope and pray". Not VERY informative mail you got. But at least we know SOMETHING,. Last edited by HurtigruteMartin; November 13th, 2009, 02:51. Not VERY informative mail you got. (I put my money on 'talfh' here for info..., if he's still on board).